MRS2578 is a potent P2Y6 receptor antagonist with IC50 of 37 nM, exhibits insignificant activity at P2Y1, P2Y2, P2Y4,and P2Y11 receptors. Ticlopidine HCl is an P2 receptor inhibitor against ADP-induced platelet aggregation with IC50 of ~2 μM. Prasugrel hydrochloride is a piperazine derivative and pletelet aggregation inhibitor that is used to prevent thrombosis in patients with acute coronary syndrome. Cangrelor is a potent, competitive P2Y12 receptor inhibitor that is administered by intravenous infusion and rapidly achieves near complete inhibition of ADP-induced platelet aggregation. Ticagrelor is the first reversibly binding oral P2Y12 receptor antagonist with Ki of 2 nM. Effect of antiplatelet drugs on platelet aggregation in healthy individuals. Samples from healthy individuals were preincubated with anti-platelet drugs (n = 3). Curves and columns show mean platelet aggregation and the relationship between platelet aggregation and drug concen-tration. Bars represent standard deviations. *P < 0.05 as compared with platelet aggregation with the same agonist but no drugs added; pairedStudent’s t-test. (A-C) The drugs tested were abciximab (A), ticagrelor (B), and vorapaxar (C). 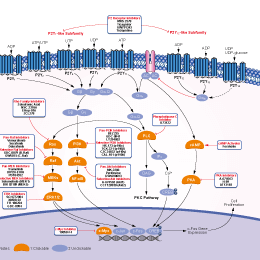 A-804598 is a selective P2X7R antagonist with high affinity at rat (IC50 = 10 nM), mouse (IC50 = 9 nM) and human (IC50 = 11 nM) P2X7 receptors. A-317491 is a novel potent and selective non-nucleotide antagonist of P2X3 and P2X2/3 receptors with Ki values of 22 nM and 9 nM for human P2X3 and P2X2/3 receptors. Clopidogrel is an oral, thienopyridine class antiplatelet agent. (A) HPLC glycan traces of IgG recovered from joint after K/BxN and PBS or B4ST6Fc treatment with or without clopidogrel. (B) Ratios of monosialylated and agalactosylated glycans (S1/G0) from IgG described in (A).